The familiar prayer for the State of Israel, which is more literally titled “a Prayer for Peace for the State” tefilah lish’lom hamedinah, was written in 1948 by Rabbi Yitsḥak haLevi Hertzog (edited by S.Y. Agnon) in what had up until then been Palestine, in a time of war. The state was under direct attack by the Arab armies, and there was little distinction between peace, survival, and victory. As we approach Israel’s 70th birthday, it is time to make such distinctions. Israel and the Jewish people live in a much more complex reality today, where the triumph of one political party or set of goals can radically change the outlook for peace, and the possibility of justice. In our time, praying for peace for the state of Israel mist include praying for the rectification of its relationships with neighboring countries and with the Palestinian people, some of whom are Israeli citizens, and most of whom are in some way under Israel’s control. 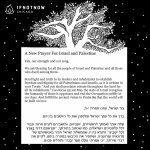 This prayer assumes that the best reality for the Jewish state is also the best reality for all of her citizens and for everyone who lives “in the land,” no matter where they are in relation to the Green Line or Areas A, B and C. . . . Categories: Medinat Yisra'el | Tags: Medinat Yisrael, Religious Zionism, Progressive Zionisim, State of Israel, 21st century C.E., 58th century A.M.
Sovereign of the Universe, accept in lovingkindness and with favor our prayers for the State of Israel, her government and all who dwell within her boundaries and under her authority. Reopen our eyes and our hearts to the wonder of Israel and strengthen our faith in Your power to work redemption in every human soul. Grant us also the fortitude to keep ever before us those ideals to which Israel dedicated herself in her Declaration of Independence, so that we may be true partners with the people of Israel in working toward her as yet not fully fulfilled vision. . . . The Prayer for the Welfare of the State of Israel was composed by Rabbi Yitsḥak haLevi Hertzog, edited by S.Y. Agnon, and first published in the newspaper Ha-Tsofeh on 20 September 1948. . . . In September 1948, while editing Rabbi Yitshak haLevi Hertzog’s new Prayer for the Welfare of the State of Israel, S.Y. Agnon (1888-1970) drafted this adaptation. . . .
My heart, my heart goes out to you Zion Tears, jubilation, celebration, grieving Did we not dream a dream that came to be? And here it is—both song and lament. . . .